If you’re longing for some great sandwiches in Tokyo, try Conti et Mer, who have a good range of “French-style”, take-out sandwich boxes and sweets, and party platters. 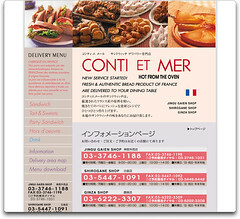 Conti et Mer has three shops, in Jingu-gaien, Shirokane and Ginza, covering most of Tokyo for delivery. Their minimum order is JPY 2000 within their delivery areas, and more for areas outside that. Sandwiches include Ham and Gruyere Cheese, Foie Gras and Prosciutto, Milano Salami and Cheese, Turkey, Grilled Herb Chicken, Mozzarella and Tomato, Baked Ham and Egg, Ham and Brie Cheese, Pate de Campagne, Prosciutte and Mozzarella, Tuna and Herb Salad, Beef Pastrami, Brie and Vegetable, Terrine Provancale, and Grilled Vegetable. A ”Sandwich Box” set with baguette sandwich, hashed potatoes and a sweet (usually apple pie) costs about JPY 1000 to 1500, or you can get your sandwich in the “Seigle Box” which has the sandwich on rye bread. These sandwiches might not be exactly authentic French, but they taste great to me. Hope you enjoy them sometime.